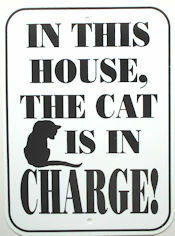 This cat sign is made of heavy weight plastic with a hole at the top and bottom for mounting or hanging. This cat sign is 8 3/4" wide x 11 3/4" high. A cat sign for a cat owned house for sure.